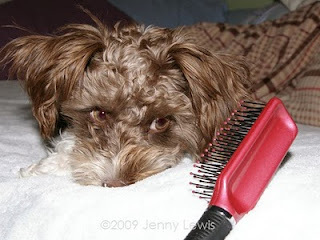 Mommy always says that it's important to brush your hair to keep it pretty and healthy. But I'm not as keen to that idea as she is. I like the actual feel of the brush running through my hair, but sometimes the bristles are a bit much, so I am always squeamish about it. And I swear, sometimes that thing comes out of nowhere, sneaking up on me when I least expect it! I usually try my intimidating stare technique on the brush, just like Bolt does in his movie. I am merely trying to keep the brush in line and to make sure that it knows I will only put up with so much. But just when I think I have outsmarted it, Mommy scoops me up (usually after I have gotten into something sticky!) and brings THE BRUSH out and starts fussing over me. I am stealthy, however, and I occasionally get my revenge on the irritating brush. I can sneak up on that brush just as well as it sneaks up on me...take that! 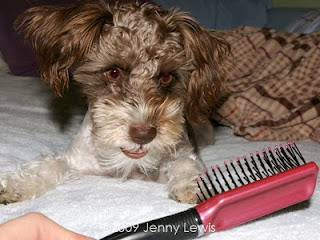 I hate hairbrushes too Pixel. I've tried growling at them but it doesn't seem to make any difference. Biting them seems to be a better method. I see you're already trying that out :) Beat that brush. Together we can do it! Haha, Sadie! We must be kindred spirits then. I have since adjusted my love/hate relationship with them...now, I must be pelted with little tiny treats, every few seconds. THEN, I will allow a little brushing. But I still hate the blow dryer after a bath! So glad to meet you my friend! we hate those torture devices too. 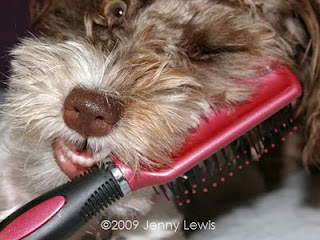 brushes should be chewed on, not put on our furs!